I bought that EF 50mm f/1.8 II lens separately, though, for $45 used. Even though it’s least expensive prime Canon sells for its EOS cameras, it’s widely considered to be a great lens. 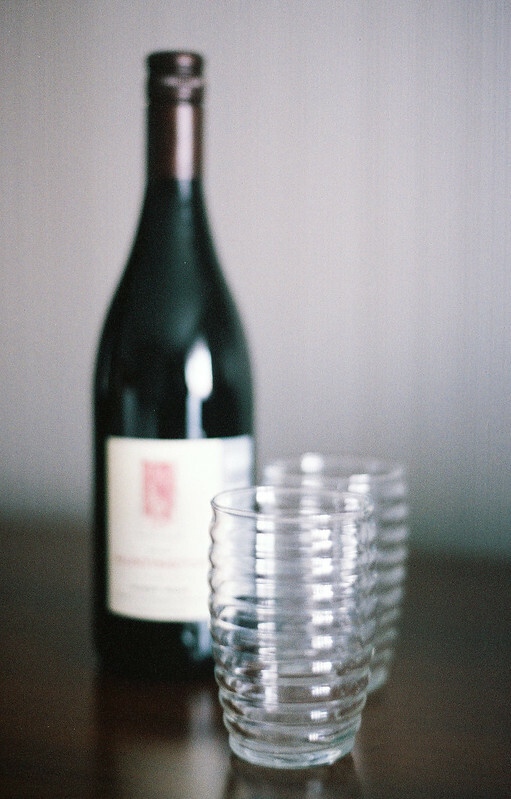 I feel like I get to know a camera best when I shoot it with a 50mm prime. And I wasn’t very impressed with the 35-80mm lens that came with my 630. It’s weird to me that the 650, which preceded the 630 by two years, has a higher model number but fewer features. The 650 lacks some of the 630’s modes, and its motor drive is a little slower (3 fps vs. 5 fps). Also, the 650 doesn’t automatically rewind the film after the last frame as the 630 does. You have to flip down that little panel below the film door, and press the rewind button. I learned that the hard way — after shooting the roll, I opened the camera and ruined a bunch of photographs. Drat. 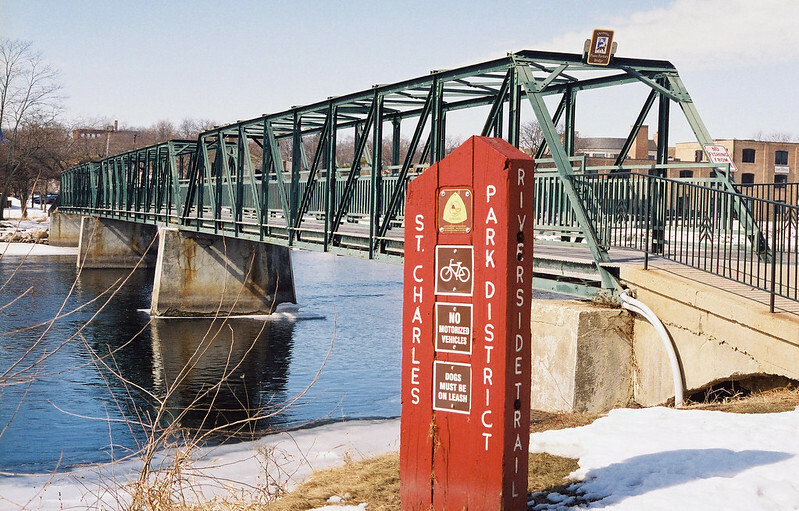 I dropped some Fujifilm Superia X-tra 400 into the 650 and took it along on a trip to St. Charles, Illinois. The Fox River flows through town. You’ll find fox statues all over town. 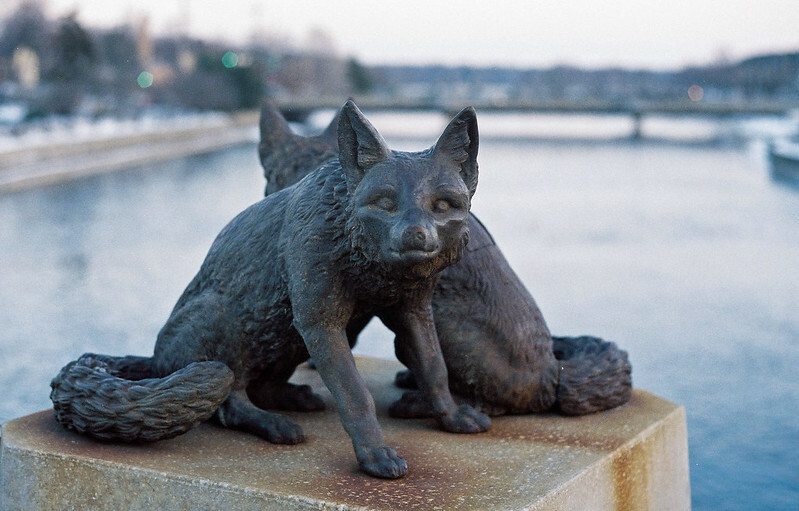 These twin foxes guard the bridge that carries St. Charles’s main street over the river. 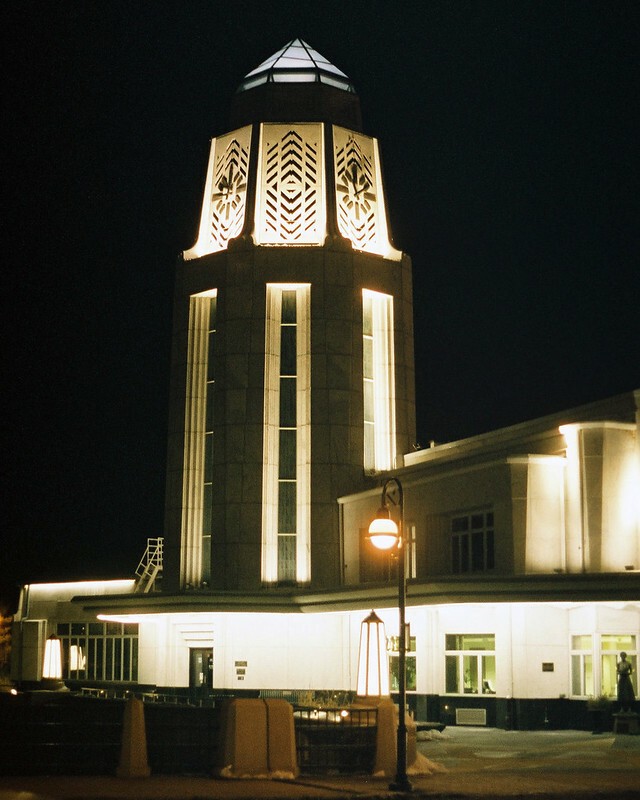 Fast film and a fast lens let me get these night shots of the art-moderne St. Charles Municipal Building. The dome changes color. The downside of using a 50mm lens was that I would have had to back up all the way into the river to get the entire building in the photo. 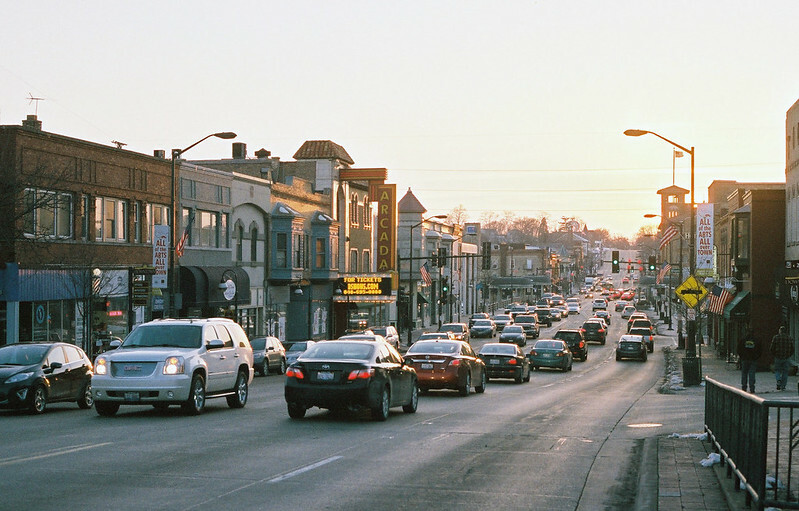 Here’s a near-sunset shot of the main drag through St. Charles, also known as State Route 64. And here’s a daylight shot of a footbridge over the Fox, south of downtown. As you can see, the 650 and this lens handles a bunch of lighting conditions with ease. But I’ll bet that if I’d brought one of my Pentax SLRs with a 50mm Pentax prime attached, I’d’ve gotten warmer, livelier color tones on the same film. These colors just don’t jazz me. Fast film and fast lens let me shoot indoors with available light, too. The in-focus patch was mighty thin, however. The 650’s autofocus worked fine for the most part. It’s a little slow, but for what I was shooting it didn’t matter. Once in a while I was puzzled by its focusing choices, as in this shot. But this is my favorite photo from my test roll anyway. I like the light play and the rough surface of the desk my Kodak 35 was sitting on. 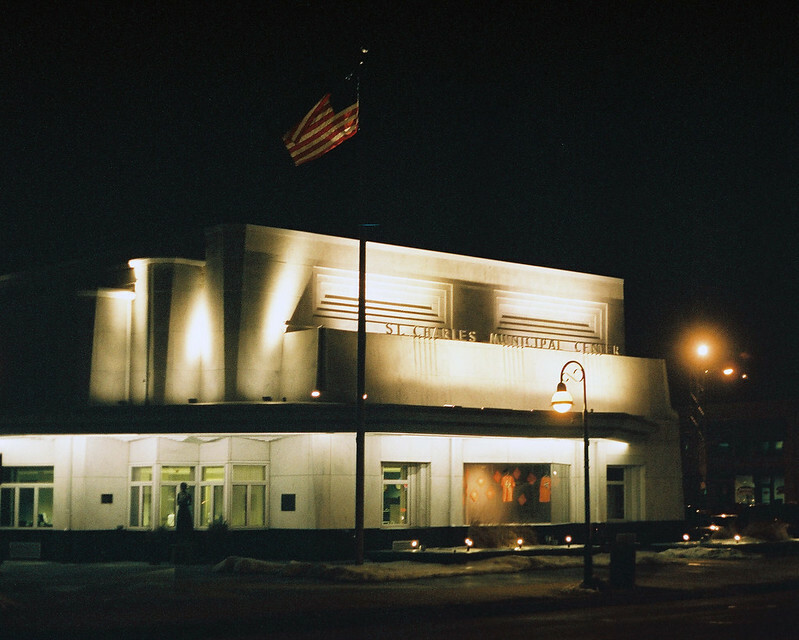 To see more photos from my test roll, check out my Canon EOS 650 gallery. I shot everything in straight program mode and let the camera focus for me. The EOS 650 handled just like the EOS 630, which is to say fine, which is also to say uninspiringly. Frame, press the button, zip-zap-click. I just don’t have as much fun with auto-everything SLRs. But as you can see, this one performed competently. 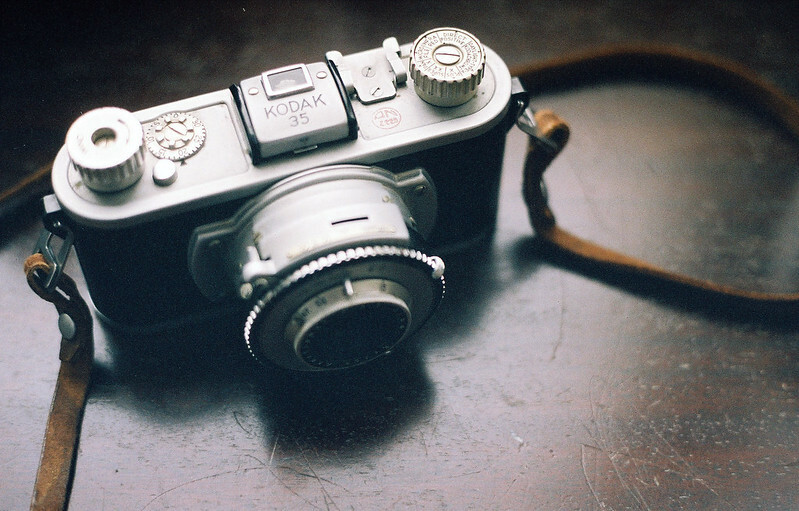 Do you like old cameras? Then check out all of my vintage gear reviews! I had a line on an EOS 1 not long ago but lost out. Looked like a fine camera. Nice review and photos, I have just got one of these off eBay for £6 about $9 it arrived today so will put a film through it soon. I like the night shots. That’s the great thing about these old EOS cameras — you can sometimes get them for a song. I picked up an EOS RT, which is essentially an EOS 630 with a pellicle mirror, for cheap money. Back in the day, the claim to fame was a higher frame rate, and no mirror blink. The one nice thing about it, is you can get away shooting crop sensor (EF-S) lenses, because the mirror is fixed. I have a Tokina 12-24mm zoom that works nicely, for the most part. You get a vignette at 12mm, but it is gone by 15mm. I hear that with those pellicle mirrors the viewfinder isn’t as bright. Do you find that? This is true, but I find I need a side by side comparison, to see a difference. The pluses are 5 frames per second, not huge these days, quieter with less vibration (no mirror slap), and no blackout during the shot. I have had one of these for a few years and like it pretty weil. I don’t do much action photography so the slower auto focus isn’t a problem. I have always had good results with the auto exposure. I usually just use it in program mode unless there is some tricky lighting. Still if I am going to use film I prefer the mechanical classics. 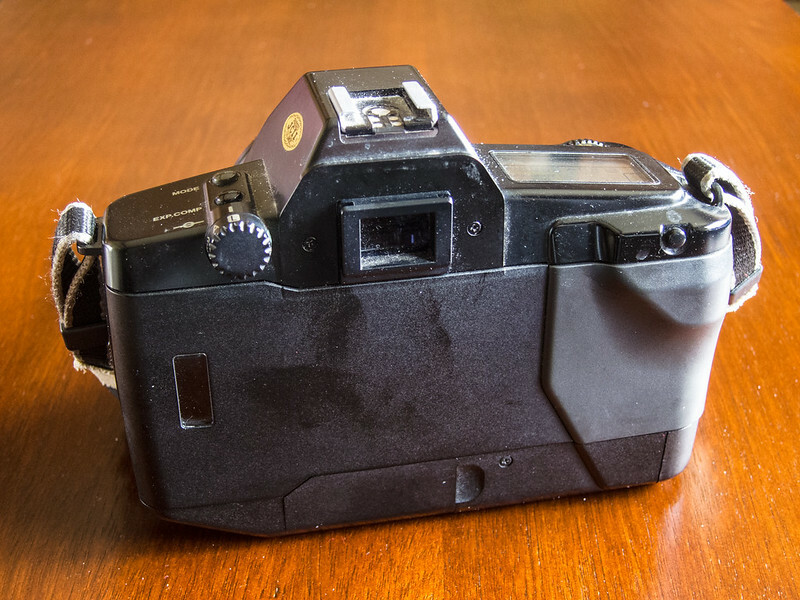 I just seem to be unable to fall in love with these plastic blob SLRs, whether Canon or Nikon. But they are competent shooters nonetheless. And I’m with you: when I use one of these, I just stick to program. My EOS 650 still gets pretty regular use and gives fine results. Plus, I have a sentimental attachment to it as well. It was the last camera that my dad purchased and used in the late 80’s. I remember it being a big deal when he brought it home and it seemed very advanced back then. He was proud of the EOS! When I shoot with it now I tend to use aperture priority mode most often and I find that exposure metering always works very well. Thanks for writing about your experiences. That’s great! It’s cool that you get to use your dad’s old camera. You just might inspire me to dig out my 620 out of my storage loft to get back to film shooting. I moved my lenses to a 5D a few years ago. I got the 620 as a pawn shop buy and enjoyed taking many photos with it until I moved to digital. 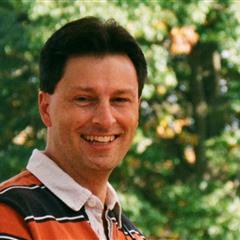 Having been very accustomed to the Canon EOS interface it was not a difficult transition. The thing about those earlier cameras is the focusing mechanism specifically works off that center spot that looks kind of like brackets. The subsequent cameras had multi-zone focusing, but this and the 630/650 you have to focus with subject in center and then recompose as needed. I’d also suggest that if color is not lighting you up with the Canon EOS, try out a few rolls of Black & White film, and try exploring the Aperture-priority mode some more. It might take some getting used to using the finger dial to scroll the aperture back and forth, but you might find some more satisfying results. 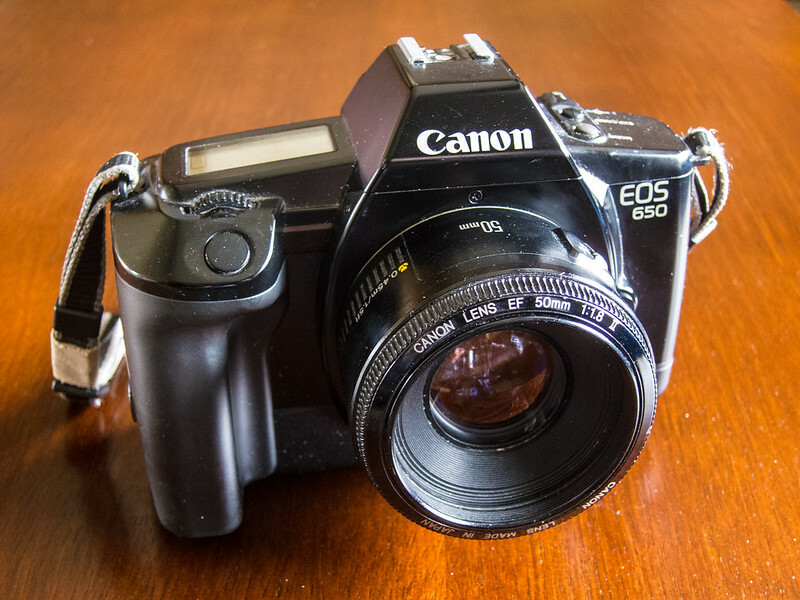 I just recently shot a Canon EOS Rebel and liked it a lot better than this 650 — well, in terms of how it handled, anyway, as the Rebel’s shutter is toast and I got no images back. But its smaller, lighter body and more intuitive controls just make it a more compelling shooter. Again, it would if it worked. But I’d have a working Rebel over the 650 any day! I Like all the early eos 600 series cameras. I own all the models, and enjoy shooting with them. The 650 is a good camera but, go for the 620, or the 600/630 as the 620 has faster top shutter speed and flash sync and, the 600/630 has faster frame rate and faster AF and they both have the program shift function, which the 650 lacks. As i say they are excellent cameras and can be picked up for only a few pounds/ dollars, and are well worth a look. I have a 630 as well. I’ve been experimenting lately with the later, smaller-bodied EOS models like the Rebel S. I like these older ones okay but they’re pretty big. But you’re right, they go for a song.